2017 Gjønnes Medal winners Richard Henderson (left) and Nigel Unwin with incoming CEC Chair Louisa Meshi. The Gjønnes Medal in Electron Crystallography is awarded every three years and recognizes an outstanding contribution to the field of electron crystallography. The Gjønnes Medal is accompanied by a certificate and funding to present an invited Keynote Lecture at the triennial International Congress of Crystallography. This award is managed by the Awards Sub-committee of the Commission on Electron Crystallography (CEC) of the IUCr. This Sub-committee is responsible for soliciting and evaluating and recommending a nominee to members of the CEC for final approval, or recommending that no award be made. Nomination for the Gjønnes Medal is open to scientists and engineers in all areas of electron crystallography defined in the broadest context as the branch of science that uses electron scattering and imaging to study the structure of matter. Nominees of any nationality are eligible. It is expected that the nomination will be for a single person. However, since breakthrough innovations often involve more than one individual, the nomination can be for two or three people, maximum. In the case of multiple nominees, it must be shown that each person contributed roughly equally to the innovation. The Award will not be bestowed in absentia except in extraordinary circumstances. Current members of the CEC, members of the IUCr Executive Committee and previous recipients of the Gjønnes Medal are not eligible. Nominations are invited for the next Gjønnes Medal, which will be awarded at the IUCr Congress in Prague, Czech Republic, in August 2020. A letter of not more than 3000 characters evaluating the nominee's qualifications in the field of electron crystallography and identifying the specific work to be recognized. There is no nomination form, so this letter is considered the nomination 'application'. A list of the most important publications of the nominee. The deadline for receipt of nominations is 30 April 2019. 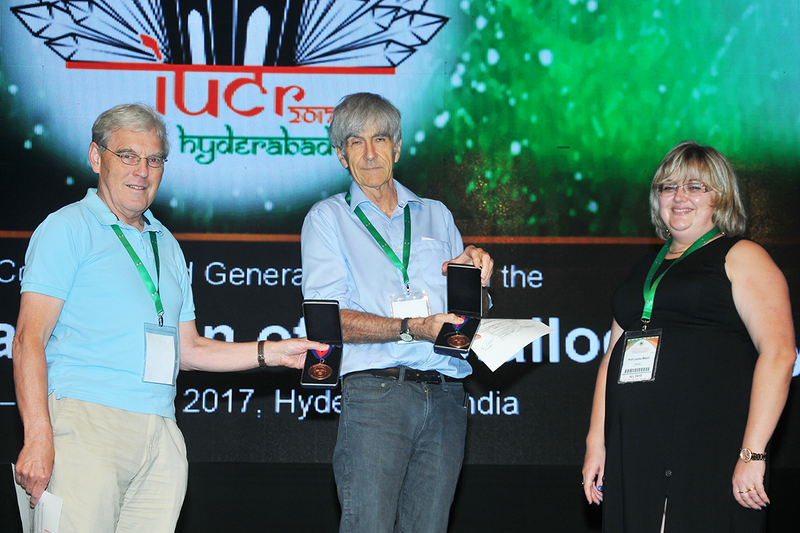 Previous recipients have included the Nobel Prize winner Richard Henderson, who along with Nigel Unwin, received the 2017 Gjønnes Medal at the 24th IUCr Congress in Hyderabad, India, for the development and powerful application of structural determination methods for biological complexes at near-atomic resolution using electron crystallography. In 2014, John Steeds and Michiyoshi Tanaka were awarded the medal for their outstanding contributions to convergent-beam electron diffraction, and the 2011 awardees were Archie Howie and Michael Whelan for the development of the dynamical theory of diffraction contrast of electron microscope images of defects in crystals, and other major pioneering contributions to the development and application of electron microscopy, diffraction and spectroscopy of materials. The medal is named in honour of its first recipient, Jon Gjønnes, who received the award at the 21st IUCr Congress in Osaka, Japan, in 2008. He said “The basic scientific achievements of the last century - which one may epitomize by three words: the atom, the computer and the gene - rest on two main efforts: Quantum theory - which is prerequisite to our understanding of the atoms and the way they are put together, Crystallography - which is the basic, never-ending task of exploring the atomic architecture of matter".